Nick Hornby's memoirs of reading as published in the Believer each month are my favorite writing about reading. I read the new collections as they're released and come back to them, either because my memory is so bad I forgot I already read them, or because they are awesome: take your pick. 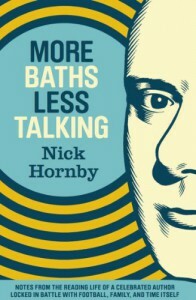 My reading taste doesn't overlap all that much with Hornby. Nonetheless, I love his writing, especially his writing about being a reader. These four books of Believer columns are one of the highlights of my reading life. I've no idea what it is like to be flown into LA to attend the Oscars as a nominee, and can't really imagine it. But I do know what it is like, sitting on the sofa between two children, desperately trying to finish the last 25 pages of a good novel when someone else wants you to look at what's on the TV, and the noise is escaping from someone else's headphones. That I know very well. It doesn't matter what he reads, it matters that he loves reading. Pretty much the same attitude I take toward my friends and folks I follow at GR [and now, here at BL].